Fear of change is very common. Think about it. Do you have a tendency to stay in your comfort zone? I know I do. Even if that comfort zone includes some unhealthy behaviors, making new changes can be hard. It might require learning some new skills and that takes time and effort. Oh know, one more thing on my to-do list! If you want to begin making healthier choices, change is inevitable. Change can generate a sense of anxiety and insecurity. After all, we tend to cling to stability and how we've always done things. But if those "things" are not helping and instead hurting you, it may be time to really examine them and make a few new decisions. Sometimes the thing you fear may actually turn out to be fun and good for you. 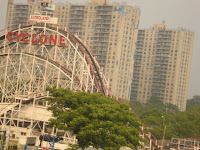 I remember as a teenager, I was afraid of a roller coaster at Coney Island called the "Cyclone". My friend Kathy invited me to go with her neighbors for several years in a row. We lived on Long Island and they would rent a bus and we all piled on and went to Coney Island for the day. It was lots of fun until Kathy and I would get in line for the Cyclone. Once we got to the front of the line, we'd chicken out. We'd done this so many times over the years but we finally DID IT! We bit the bullet and rode the Cyclone...and guess what? We loved it. We loved it so much we got back in line and rode it again. What about you? Maybe you were never very athletic and so you can't imagine attending an exercise or dance class. What if I look like a jerk? Well, let me tell you that you wouldn't be the first one. I love dance but the last dance class I took was way back in sixth grade. Taking a dance class at my age? Yes, I was scared and afraid I'd look like a fool. But, I timidly signed up for Dance it Off. It was an exercise dance class that incorporated jazz combinations along with floor work, and abdominal and muscle toning. It was being offered at a dance studio in Phoenix called Destiny Dance. Now talk about intimidating. The instructor of this class was the owner of the dance studio and she was Sheryl Cooper, the wife of rocker, Alice Cooper. You remember the song "School's Out", don't you? I must say that I did make a fool of myself in that class. I'm not very flexible so it was difficult doing splits (!!!) and even touching my toes without bending my knees. But I had fun, I learned so much and I made new friends. I had to get out of my comfort zone but in the process, I gained so much more. Sheryl Cooper turned out to be a wonderful, kind and very patient teacher. She and her husband are Christians and help out in the community through their foundation called Solid Rock. Sheryl is also a very pursuasive person. Destiny Dance has a dance recital every year. And guess who participated that year? Yours truly...in a dance recital at my age? YES I DID! That's me in the last row, 3rd from the right. So, if I can make a fool of myself you can too! Get out of your comfort zone and try something new and healthy. You never know. You might just enjoy it and you'll be learning something new and fun. Do you have any stories to share of something you might have feared but did anyway? I'd love to hear from you. Thanks for your encouragement about change! There are so many Biblical examples of people God called out to make changes - whether physical or mental. I have just started attending a Bible Study on the life of Moses -- what changes God called him to make! Your timely article points out current applications to the same anxiety and fears that have been common to mankind since...well, since Moses for sure! Thanks! Thank you Carol, for sharing your comments. Fear and anxiety often accompany change. But if the Lord is calling us to change, He will enable us to do that when we depend on Him. Stepping out of your comfort zone does make a huge difference in your life. I took a class about discovering your purpose and pursuing your goals, and one of the exercises was to do something outside of our comfort zone every week. For some people, it was going to a restaurant alone, taking a dance class, etc. What we found was that if you expanded your comfort zone in one area, it helped you do it in other areas as well, such as doing something personally would help professionally. Great post! Thanks for your insightful comment Kristi. I think we often miss out on many good things because we tend to stick to our comfort zones. 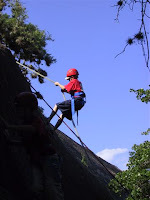 But the more we step out, the more confident we become to take the next challenge.